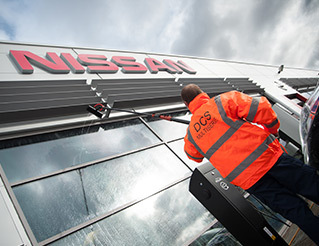 Here at DCS Multiserve, we have over 20 years of experience in delivering window cleaning in Newcastle to all types of commercial and industrial premises. Whether you have a single or multi-storey building, or a more specialist, hard-to-access facility, our team can deliver an immaculate finish inside and out. 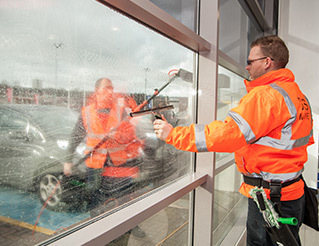 Rest assured that we always offer reliable, efficient, one-off or regularly scheduled window cleaning in Carlisle, Newcastle and throughout the UK. We use both the traditional technique of ‘mop and blade’, and the modern ‘Reach and Wash’ system. The Reach and Wash system is an extremely efficient system, offering a ground level solution that eliminates the need for ladders, giving us enormous flexibility in the types of buildings we can clean; particularly where access is limited. It is faster, cleaner, better for the environment and risk free, which continuously delivers a flawless finish, even when working at a height. Before work begins, a DCS Multiserve area supervisor will conduct a risk assessment and provide method statements for the work quoted. All our members of staff hold their IPAF cards as well, to ensure the safe and effective use of our powered access equipment whilst working at height, making health and safety the top priority. Contact us today to discuss the window cleaning requirements for your premises.